Planning on visiting the Triangle, but want high-end hotel accommodations after landing at RDU? The newly renovated Hilton Raleigh North Hills is an amazing stop for Triangle adventurers and natives alike—whether you’re enjoying a date night that includes fine-dining, or just to unwind with the whole family (pets included!) from your flight in a hotel that offers first-class service. Located near Raleigh’s historic district, the hotel is just a short stroll (or complimentary shuttle) away from downtown Raleigh and the North Hills. Whether you’re spending the night in Raleigh, or passing through to the Bull City, Hilton Raleigh North Hills offers comfort and excitement to every guest. The spacious indoor pool will make it hard to leave without taking a dip. Plus, there’s so much room for activities! Over 30,000 square feet of meeting rooms make Hilton Raleigh North Hills the perfect place for conferences and weddings. Upgraded suites and the all new dining experience at ’88 Oaks Carolina Kitchen and Bar really tie the entire experience into a neat package. The ’88 Oaks Carolina Kitchen and Bar offers a wide selection of mouth-watering spins on North Carolina comfort food favorites for breakfast, lunch, dinner and drinks. The drink menu features a customized list of local craft beers, micro distilled spirits and creative cocktails. On the dinner menu, you’ll find inspired local favorites like an 8 Hour Short Rib, Shrimp and Grits and Crab and Carolina Moon Mac—all made from local ingredients and plated to perfection. During our stay, we started off with an edamame-based guac spread that was as tasty as it was colorful, followed by fresh-cut sweet potato chips with a tangy blackberry ketchup. Unexpected, yet tasty, the appetizers set the precedent for good taste to come. For entrées, we enjoyed the Tagliatelle with Wild Mushroom and the Crispy Skin Salmon, each plated to perfection and adorned with succulent,fresh heirloom tomatoes. The meal was finished off with a Smoke S’More Pie, a decadent construction of graham cracker crust, chocolate crème custard, and a campfire smoked toasted marshmallow whip topping. Full-bellied and cozy, I slept like a baby. After recently spending the night at Hilton Raleigh North Hills, I can tell you that I’ll definitely be going back for a full-service staycation that can’t be beat. Don’t forget to stop by the hotel gift shop to buy shirts, plushies and more from your favorite Traingle area teams, like the Durham Bulls! Previous articleIt’s the Biggest Patchwork Market Yet. Here’s some Vendors to look out for. I’m a freelance content writer and musician who is fueled by equal parts coffee, eclectic local menus, and the outdoors. I moved to the Bull City in the summer of 2015, having spent my whole life as a Louisiana native. 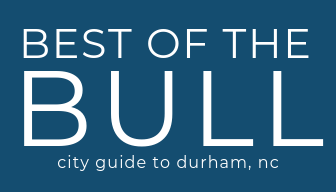 Brick by brick, I’ve fallen in love with Durham’s entrepreneurial spirit, commitment to art, down-and-dirty nightlife, world-class food, and social diversity. When I’m not fumbling around with words and ideas, you can find me on a local hiking trail with my pack of five dogs or downtown catching a live band or pop-up dance party.